If you are looking for a “jack of all trades” for red wine pairing, Malbec is worth a look. Successful Malbec food pairings are easy to achieve as long as you follow some basic guidelines. Keep in mind that it is softer with less tannins than many other reds wines so it doesn’t stand up to the heaviest meats as well as a Cabernet Sauvignon or a Nebbiolo. Malbec does pair well with food like leaner meats as well as many pasta dishes. Malbec is lower in tannins than many read wines which make it a fine compliment to lean meats. Fattier meats need wine heavy with tannins which act to dissolve fat that has accumulated on the taste buds. 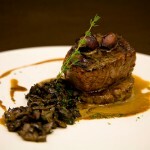 Pair Malbec with this beautiful grilled tenderloin of beef. 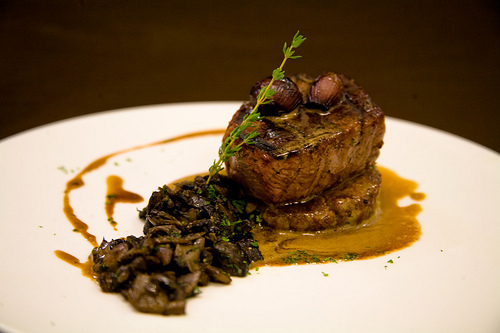 Filet Mignon, which is actually tenderloin of beef that is portioned into steaks, works equally well. Some lamb can be quite fatty so make sure that you have a very lean cut if you are going to pair it with Malbec, otherwise the wine will be overwhelmed by the strong flavor and fat of the lamb. 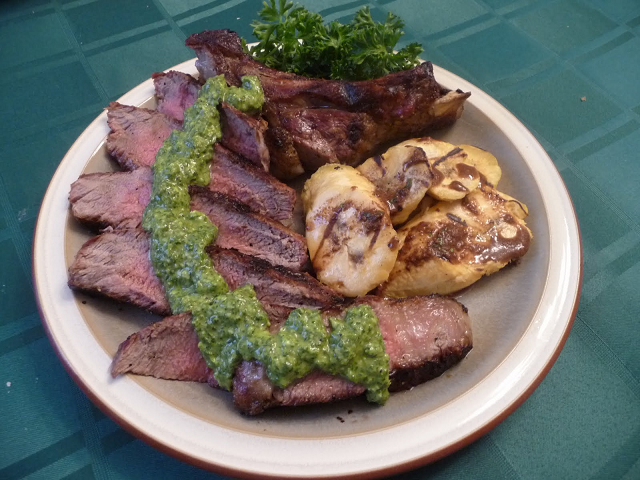 Try pairing it with this subtle herb roasted lamb chops recipe. Pork often goes well with Malbec because its a leaner meat than beef. Just avoid the fattier cuts. Fattier meats need heavier tannins to “sweep” the fats off of your tasted buds which most Malbecs don’t have. Try these simple grilled pork chops. 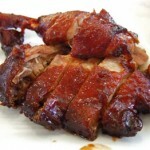 The gamier meats like duck can overwhelm Malbec because of the stronger flavor and/or heavier fat content than chicken. Pairing duck with Malbec is a good option in particular because the duck has more fat than most other fowl. The Malbec’s tannins, although light, can still clear the fat from your tongue’s pallet. 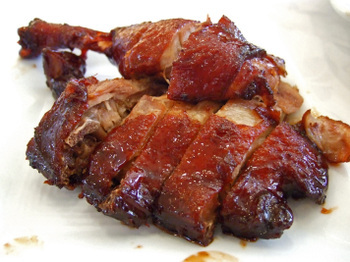 This roast duck recipe is a very nice accompaniment. Pesto’s strong flavor is complimented nicely by Malbec as well as some of the refreshing white wines. Heavier tomato based sauce will overwhelm Malbec’s lighter tannin and acid structured body, but if it is cut with wine, broth or a touch of cream, Malbec will often work well. Mix your Pesto with a little tomato to give it a little more body to compliment the Malbec. This recipe shows whole cherry tomatoes but I find that when I finely chop and sear the tomatoes it helps blend the flavor throughout the pasta a bit better. Although Malbec originally hails from Bordeaux in France, it’s become Argentina’s national grape. 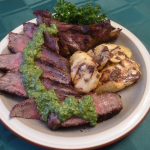 Beef with a Churrasco marinade topped with Argentina’s traditional Chimichurri sauce is a natural Malbec food pairing. When looking for other dishes to pair with Malbec, consider looking at food that pairs with Merlot for guidelines. Malbec is similar in structure but with slightly less tannins. Pairing Malbec with cheese doesn’t offer a great number of options. If you’re looking to pair Malbec with cheese, lean towards a sharper cheddar or even hard cheeses like Parmesan. Avoid pairing Malbec with pasta in a heavy cream sauces. Although not particularly heavy in acid or tannins, there is enough that it will react slightly with the cream to produce an unpleasant taste. Sauces that just use a touch of cream as a finisher are generally OK. Learn more specifics on how best to serve or age Malbec by visiting our encyclopedia’s varietal page. Elsewhere on our blog, we’ve also provided some helpful, general guidelines in a wine and food pairing post which you can find by clicking here.